Create salon-quality color in 30 vibrant shades with our revolutionary 2-step system. 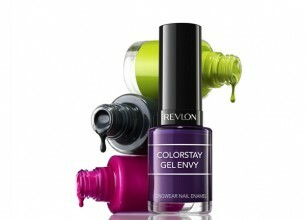 Brush on the base + colour in one, and then finish with the protective ColorStay Gel Envy Diamond Top Coat™ for superior strength. Together, they create vivid color, brilliant shine and gorgeous life-resistant wear. What a lovely product this turned out to be. The brush is broad and flat, allowing the colour to be spread evenly and easily. I love that the base coat is included in the colour coat, and I am happy to report that two coats was all it took for even and bright colour. The ColorStay Gel Envy Diamond Top Coat applied just as effortlessly and sealed the polish beautifully. My nails were chip-free for 4 days, but it was only on day 6 that they started looking scruffy and I removed the polish. I’m very impressed by the long-wear aspect – I can’t wait to try the other shades too! This lovely little product is meant to be a long wearing nail colour. It was quite successful and it did add a gel finish to it, which is fantasic. I found that it was very successful – It lasted 5 days, chip-free! I like the sturdy packaging, and I found that it is simple but attractive. The nail polish is a good consistency and I found that it is not too runny and spreads easily. It worked well for me. I would recommend this product!